Nonprofit Flussbad Berlin has proposed a remarkable brownfield rejuvenation project for the center of Berlin: transforming an underutilized canal into an enormous outdoor natural swimming pool for summer recreation. And in winter, the pool would serve double duty as a skate rink. 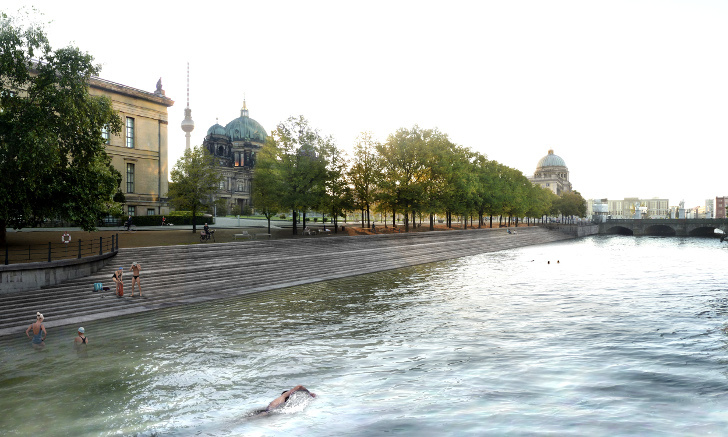 The canal, which flows along one side of the city’s UNESCO heritage-listed Museum Island, would be filtered by gravel beds to ensure public health and safety in the water, and the natural swimming pool, known as a Flussbad, would be a whopping 750 meters in length. Right in the historic center of Berlin, the Spree Canal splinters off the River Spree and then rejoins it downstream, forming the city’s iconic Museum Island. The award-winning proposal consists of three sections within the canal. The first is the swimming pool, which would run from a weir right next to the Federal Department of Foreign Affairs to a new weir at the Bode Museum, where the canal connects back into the main river. The weir would be necessary to stop the backflow of unfiltered river water into the canal. Upstream from the pool would be a gravity-fed filtration system using gravel and wetland plant beds. The system would clean around 500 liters per second, which is enough to completely flush the pool’s capacity – the equivalent of 12 Olympic swimming pools – once a day. Further upstream again, the canal would be regenerated into a natural river habitat. Flussbad Berlin describes their proposal: “As a biotope it creates shelter to endangered animals and plants. And it also becomes a piece of the Spree river ecological functionality within the city. Simultaneously a new urban park is built next to the artificially designed ‘old river bed’.” One of the major works the project would require is the addition of access steps at the canal edges leading down into the water. Flussbad Berlin intend that the pool should be accessible from all sides. On the eastern bank new open staircases at ‘Lustgarten’ and Schlossplatz would connect the street level with the water, while smaller stairs and ladders would connect to a boardwalk below the western canal wall that would run along the whole length of the pool. Changing rooms are envisioned for the basement of the historic Emperor’s Monument in front of the Berlin Palace. The redevelopment is envisioned as a major new green space for the increasingly dense inner city, and as a place where residents can mingle with tourists and enjoy a calm oasis from the summer bustle. Issues to be overcome for the successful implementation of the project include the current overflow of sewage into the canal. Unfiltered sewage water spills over into the river up to 30 times per year, when strong rain briefly exceeds the capacity of the city’s sewerage system. A bypass system or a super-size tank along the western canal wall are planned for the development, which would return the excess sewage back to the system once capacity is returned. The bigger issue to contend with is that the river is owned by the Federal Government, which needs to be won over, while the the banks of the canal are municipal property. You can support the project’s lobbying endeavors through their website.